Nevermind asking for Facebook passwords: Are social games the new HR recruitment strategy? Social gaming is huge. Top Facebook game developer Zynga, reports over 220,000,000 monthly active users (MAU), with the remaining 39 of the Top 40 developers each reporting MAU numbers in the tens of millions. Recently, in my daily internet rummaging, I came across Marriott International’s Human Resources Careers page and was intrigued by the Facebook game they were promoting that targets college and university students. I was instantly impressed that they jumped into the world of social gaming with My Marriott Hotel, as this was the first time I’ve heard of an organization trying to recruit employees using social games. The game itself is similar in concept to the highly-popular Farmville and Cityville games (both Zynga games). In My Marriott Hotel, users create their own restaurant, buy equipment and ingredients on a budget, hire and train employees, and serve guests. You earn points for happy customers, and lose points for bad service. Your primary goal is to turn a profit. 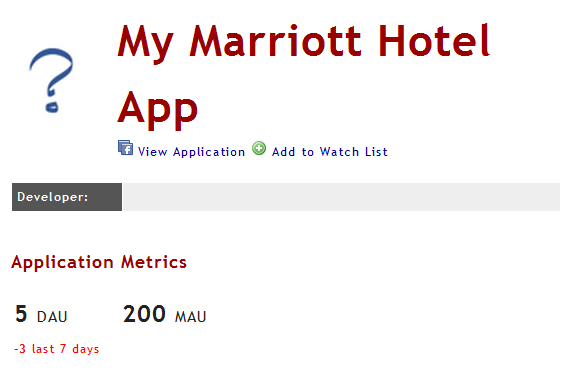 What I find most interesting is how much information Marriott, as an employer, gathers on potential employees. To start, when authorizing the app, it asks to “access your basic information: Including name, profile picture, gender, networks, user ID, list of friends, and any other information you have made public.” The Facebook Developers’ Policy expands on that information to include email, birthday, and current city. That’s a lot of information to start pre-screening your applicants. Now pair this data with some of the in-game behaviour and they would get some new and unusual insights into potential hires. It’s brilliant, really. For example, in-game users get to decide the gender and ethnicity their supervisor and employees. Each and every finished product must be checked to make sure it meets quality standards. Ingredients must be ordered to make sure enough is on hand – but not too much that you are overstocked. And finally players must hire and train this staff to make sure they have a full brigade. I’m not sure to what level they are using this information because when I contacted them (several phone calls, voicemails, and emails) I was told that the person responsible for leading that project has since left Marriott International and there is nobody internally who can comment on the game. Am I reading too much into this? Perhaps. But it’s not outrageous to think that a multinational organization would put such an effort into getting the right employees. Recently, it’s been widely publicized that employers are now asking job candidates for Facebook usernames and passwords, and ethical questions have been raised. A more reasonable approach would be to “friend” the potential employee, or go the My Marriott Hotel route, and use the profile data and personal information gathered from Facebook games to access the details they may be after. After all, the cost of a bad hire is enormous. If social games can offer some insight to hiring managers, they are one step ahead of the rest. 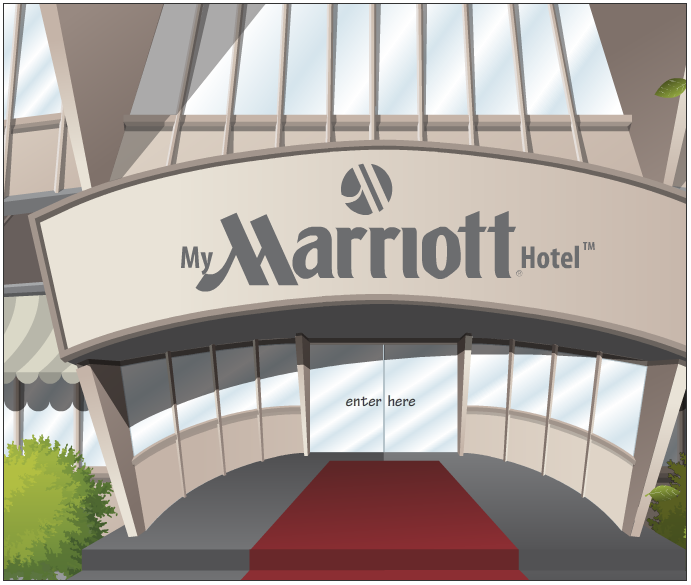 But the problem with My Marriott Hotel is, and this may be part of the reason they didn’t want to provide a comment for this post, nobody is playing the game. 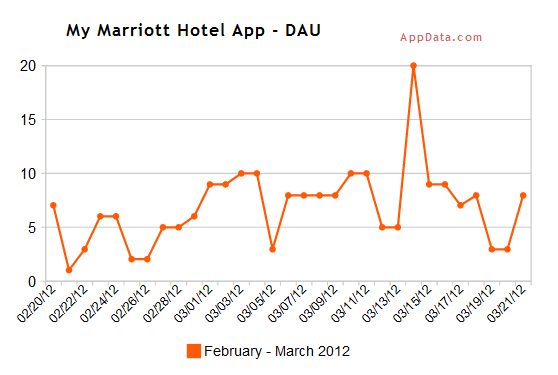 According to www.appdata.com, over the last month My Marriott Hotel has 5 daily active users (DAU), which works out to about 200 monthly active users (MAU)… and one of those 5 DAUs was me. Their Facebook Careers page is pretty active, but the game is nowhere to be found. The gameplay itself is instantly amusing, but that feeling wears off pretty quickly. I spent a few hours playing a number of rounds to see if it improved, but I eventually got bored and decided to stop. It clearly shows that we just can’t wait to get that online content. Perhaps this is because we know that we can get what we are looking for elsewhere online. If I want to buy a new Android phone online, I have virtually unlimited options – if Virgin Wireless isn’t loading quickly enough, I’ll hop over to Comcast, or Rogers, or Bell, or Cellular One. And if I’m looking for the latest news headlines, well there really is no end to where I can find this information. But what I find the most interesting about this infographic is how this “instantly connected” feeling has changed our offline consumer behaviour. Perhaps this is because the last section of the infographic reflects elements of my own behaviour. 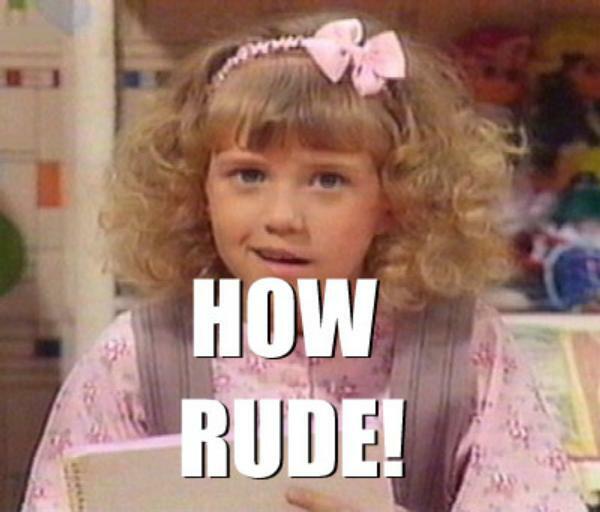 And I hate to say it, but I’m sure I have been rude to folks who are serving me too slow. I try to be as understanding as possible, but what’s taking so long? What do you think? Are you one of those rude, impatient, speed-obsessed members of the “Google Generation”? Or are you happy to wait 45+ minutes to eat at Red Lobster because somethings are worth the wait? If you’ve been following social media trends over the past few months, you will have noticed that Pinterest has been something like a phenomenon. Although not a “new” social network (launched in early 2010), users have been joining in the millions since fall of 2011. And if you have recently jumped on the “Pinsanity” bandwagon, you’re probably a woman… at least according to the infographic below – created by mdgadvertising. Women have traditionally out-participated their male counterparts in social media, with the exception of Google+, so this finding isn’t shocking. I was, however, a little surprised that the gender gap was so big on this network – 87% of users are female. Pinterest is highly visual. Your main job as a “Pinner” is to share, and re-share, photos and videos. This creates, often stunning, “pin boards” of content. Pairing the demographic information with the ability to tell a visual story, marketers have done a great job using this newly-popular social network. Most of the top ten brands using Pinterest focus on home design/decorating, beauty tips, and fashion. It’s a home for different content. Pinterest is not just another place to post the same content you have on Facebook, Twitter, Google+, and Tumblr. No matter what, your Pinterest content has to have a multimedia component. Though this does make for a very “pretty” user interface, the heavy priority placed on the visual can limit your effectiveness of sharing blog posts, or articles, that don’t have a quality image. In some cases (not many) I have not been able to pin stories because a relevant image wasn’t available. Solid referral traffic. Pinterest is showing early signs of being a real player in the web traffic referral game. Since starting to use Pinterest, I’ve noticed a modest boost in web traffic on my blog, with a few hundred referrals from Pinterest. This could be due to how active and engaged the users are – It seems like “Pinners” are not being shy about “liking” or “re-pinning” posts. But watch out for the copyright cops. If you read the Pinterest terms and conditions closely, you will find that by using the service you declare that you are the lawful copyright owner of all images, and videos, posted. You also grant Pinterest permission to use your content as they please. This has the potential to leave you open to a lawsuit. I don’t think it’s very realistic to think that the average user will be targeted… but you never know. You can learn more about the Pinterest copyright concerns on Social Media Today. If you are hungry for more information about using Pinterest for yourself, or your business, HubSpot has created a great eBook. The first two chapters are “What is Pinterest & Why it Matters” and “How to Create a Pinterest Account and Get Followers”. Then it goes on to discuss how to use Pinterest for Marketing and provides some examples of how brands are currently using the platform. If you’re interested in Pinterest, this eBook is a must.